9 out of 10 users aren’t aware that their photos, videos, documents etc. aren’t safe online. Yeah, you’ve probably heard that one from us before. That’s because we believe that data security is important and we try our best to ensure no one touches your files. What you still haven’t heard from us, however, are these 10 interesting encryption facts! Encryption is a term that comes from the science of cryptography. It includes the coding and decoding of messages in order to protect their contents. The very word cryptography has Greek origins. “Kryptos” means hidden and “Graphein” – word. One of the most ancient forms of encryption is letter substitution.Here’s an example: Substitute the letters in your message with the next ones. That way “I love pCloud” will become “J mpwf qDmpvE”. The oldest encryption attempt known to mankind dates back to the kingdom of Egypt, around two thousand years before Christ. The ciphers are found on the tomb of Khnumhotep II. They may have been, however, a joke or an attempt to create a mystic atmosphere. Julius Caesar used encryption in the days of the Roman Empire to cipher letters and messages. Generally, encryption played an important role in many wars and in military circles throughout the years. Currently, encryption is the most practical and easy way to protect electronically stored, processed or transmitted data. There are 2 parts to any encryption system: the algorithm for doing the transformation and a secret piece of information that specifies the particular transformation (called the key). 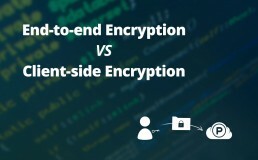 pCloud Crypto uses client-side encryption to protect your files.”]This means that your data will be ciphered on your device, before it is transferred to the pCloud servers. Your files also get an additional layer of security in pCloud Crypto thanks the Crypto Pass you insert. It’s been a month since our Crypto Challenge has started and no one has hacked our security system! It’s not too late to join our pCloud Crypto Hacking Challenge and prove us otherwise. Head over to https://www.pcloud.com/challenge/ and help us bring file security to the next level!